The most recent code is at github.com/shirriff/Arduino-IRremote. If you have any issues, please report them there. Do you want to control your Arduino with an IR remote? Do you want to use your Arduino to control your stereo or other devices? This IR remote library lets you both send and receive IR remote codes in multiple protocols. It supports NEC, Sony SIRC, Philips RC5, Philips RC6, and raw protocols. If you want additional protocols, they are straightforward to add. The library can even be used to record codes from your remote and re-transmit them, as a minimal universal remote. To use the library, download from github and follow the installation instructions in the readme. IRrecv uses an infrared detector connected to any digital input pin. The IRrecv class performs the decoding, and is initialized with enableIRIn(). The decode() method is called to see if a code has been received; if so, it returns a nonzero value and puts the results into the decode_results structure. (For details of this structure, see the examples/IRrecvDump sketch.) Once a code has been decoded, the resume() method must be called to resume receiving codes. Note that decode() does not block; the sketch can perform other operations while waiting for a code because the codes are received by an interrupt routine. The library can use any of the digital input signals to receive the input from a 38KHz IR receiver module. It has been tested with the Radio Shack 276-640 IR receiver and the Panasonic PNA4602. Simply wire power to pin 1, ground to pin 2, and the pin 3 output to an Arduino digital input pin, e.g. 11. These receivers provide a filtered and demodulated inverted logic level output; you can't just use a photodiode or phototransistor. I have found these detectors have pretty good range and easily work across a room. For output, connect an IR LED and appropriate resistor to PWM output pin 3. Make sure the polarity of the LED is correct, or it won't illuminate - the long lead is positive. I used a NTE 3027 LED (because that's what was handy) and 100 ohm resistor; the range is about 15 feet. For additional range, you can amplify the output with a transistor. An IR remote works by turning the LED on and off in a particular pattern. However, to prevent inteference from IR sources such as sunlight or lights, the LED is not turned on steadily, but is turned on and off at a modulation frequency (typically 36, 38, or 40KHz). The time when a modulated signal is being sent will be called a mark, and when the LED is off will be called a space. Each key on the remote has a particular code (typically 12 to 32 bits) associated with it, and broadcasts this code when the key is pressed. If the key is held down, the remote usually repeatedly broadcasts the key code. For an NEC remote, a special repeat code is sent as the key is held down, rather than repeatedly sending the code. For Philips RC5 or RC6 remotes, a bit in the code is toggled each time a key is pressed; the receiver uses this toggle bit to determine when a key is pressed down a second time. On the receiving end, the IR detector demodulates this signal, and outputs a logic-level signal indicating if it is receiving a signal or not. The IR detector will work best when its frequency matches the sender's frequency, but in practice it doesn't matter a whole lot. The best source I've found for details on the various types of IR codes is SB IR knowledge base. The library provides support for sending and receiving raw durations. This is intended mainly for debugging, but can also be used for protocols the library doesn't implement, or to provide universal remote functionality. The raw data for received IR measures the duration of successive spaces and marks in 50us ticks. The first measurement is the gap, the space before the transmission starts. The last measurement is the final mark. The raw data for sending IR holds the duration of successive marks and spaces in microseconds. The first value is the first mark, and the last value is the last mark. There are two differences between the raw buffers for sending and for receiving. The send buffer values are in microseconds, while the receive buffer values are in 50 microsecond ticks. The send buffer starts with the duration of the first mark, while the receive buffer starts with the duration of the gap space before the first mark. The formats are different because I considered it useful for the library to measure gaps between transmissions, but not useful for the library to provide these gaps when transmitting. For receiving, 50us granularity is sufficient for decoding and avoids overflow of the gaps, while for transmitting, 50us granularity is more than 10% error so 1us granularity seemed better. The easiest way to obtain codes to work with your device is to use this library to decode and print the codes from your existing remote. Various libraries of codes are available online, often in proprietary formats. The Linux Infrared Remote Control project (LIRC), however, has an open format for describing codes for many remotes. Note that even if you can't find codes for your exact device model, a particular manufacturer will usually use the same codes for multiple products. Beware that other sources may be inconsistent in how they handle these protocols, for instance reversing the order, flipping 1 and 0 bits, making start bits explicit, dropping leading or trailing bits, etc. In other words, if the IRremote library yields different codes than you find listed elsewhere, these inconsistencies are probably why. The IRrecv library consists of two parts. An interrupt routine is called every 50 microseconds, measures the length of the marks and spaces, and saves the durations in a buffer. The user calls a decoding routine to decode the buffered measurements into the code value that was sent (typically 11 to 32 bits). The decode library tries decoding different protocols in succession, stopping if one succeeds. It returns a structure that contains the raw data, the decoded data, the number of bits in the decoded data, and the protocol used to decode the data. For decoding, the MATCH macro determine if the measured mark or space time is approximately equal to the expected time. The RC5/6 decoding is a bit different from the others because RC5/6 encode bits with mark + space or space + mark, rather than by durations of marks and spaces. The getRClevel helper method splits up the durations and gets the mark/space level of a single time interval. For repeated transmissions (button held down), the decoding code will return the same decoded value over and over. The exception is NEC, which sends a special repeat code instead of repeating the transmission of the value. In this case, the decode routine returns a special REPEAT value. In more detail, the receiver's interrupt code is called every time the TIMER1 overflows, which is set to happen after 50 microseconds. At each interrupt, the input status is checked and the timer counter is incremented. The interrupt routine times the durations of marks (receiving a modulated signal) and spaces (no signal received), and records the durations in a buffer. The first duration is the length of the gap before the transmission starts. This is followed by alternating mark and space measurements. All measurements are in "ticks" of 50 microseconds. The interrupt routine is implemented as a state machine. It starts in STATE_IDLE, which waits for the gap to end. When a mark is received, it moves to STATE_MARK which times the duration of the mark. It then alternates between STATE_MARK and STATE_SPACE to time marks and spaces. When a space of sufficiently long duration is received, the state moves to STATE_STOP, indicating a full transmission is received. The interrupt routine continues to time the gap, but blocks in this state. The STATE_STOP is used a a flag to indicate to the decode routine that a full transmission is available. When processing is done, the resume() method sets the state to STATE_IDLE so the interrupt routine can start recording the next transmission. There are a few things to note here. Gap timing continues during STATE_STOP and STATE_IDLE so an accurate measurement of the time between transmissions can be obtained. If resume() is not called before the next transmission starts, the partial transmission will be discarded. The motivation behind the stop/resume is to ensure the receive buffer is not overwritten while it is still being processed; debugging becomes very difficult if the buffer is constantly changing. The transmission code is straightforward. To ensure accurate output frequencies and duty cycles, I use the PWM timer, rather than delay loops to modulate the output LED at the appropriate frequency. (See my Arduino PWM Secrets article for more details on the PWM timers.) At the low level, enableIROut sets up the timer for PWM output on pin 3 at the proper frequency. The mark() method sends a mark by enabling PWM output and delaying the specified time. The space() method sends a space by disabling PWM output and delaying the specified time. Sony: 12 or more bits are transmitted, most-significant bit first. Typically 12 or 20 bits are used. Note that the official protocol is least-significant bit first. (protocol details) For more details, I've written an article that describes the Sony protocol in much more detail: Understanding Sony IR remote codes. For Sony and RC5/6, each transmission must be repeated 3 times as specified in the protocol. The transmission code does not implement the RC5/6 toggle bit; that is up to the caller. Manufacturers have implemented many more protocols than this library supports. Adding new protocols should be straightforward if you look at the existing library code. A few tips: It will be easier to work with a description of the protocol rather than trying to entirely reverse-engineer the protocol. The durations you receive are likely to be longer for marks and shorter for spaces than the protocol suggests. It's easy to be off-by-one with the last bit; the last space may be implicit. To make it easier to debug problems with IR communication, I have optional debugging code in the library. Add #define DEBUG to the beginning of your code to enable debugging output on the serial console. You will need to delete the .o files and/or restart the IDE to force recompilation. If sending isn't working, first make sure your IR LED is actually transmitting. IR will usually show up on a video camera or cell phone camera, so this is a simple way to check. Try putting the LED right up to the receiver; don't expect a lot of range unless you amplify the output. The next potential problem is if the receiver doesn't understand the transmitter, for instance if you are sending the wrong data or using the wrong protocol. If you have a remote, use this library to check what data it is sending and what protocol it is using. An oscilloscope will provide a good view of what the Arduino or a remote is transmitting. You can use an IR photodiode to see what is getting transmitted; connect it directly to the oscilloscope and hold the transmitter right up to the photodiode. If you have an oscilloscope, just connect the oscilloscope to the photodiode. If you don't have an oscilloscope, you can use a sound card oscilloscope program such as xoscope. The Sony and RC5/6 protocols specify that messages must be sent three times. I have found that receivers will ignore the message if only sent once, but will work if it is sent twice. For RC5/6, the toggle bit must be flipped by the calling code in successive transmissions, or else the receiver may only respond to a code once. Finally, there may be bugs in this library. In particular, I don't have anything that receives RC5/RC6, so they are untested. If receiving isn't working, first make sure the Arduino is at least receiving raw codes. The LED on pin 13 of the Arduino will blink when IR is being received. If not, then there's probably a hardware issue. If the codes are getting received but cannot be decoded, make sure the codes are in one of the supported protocols. If codes should be getting decoded, but are not, some of the measured times are probably not within the 20% tolerance of the expected times. You can print out the minimum and maximum expected values and compare with the raw measured values. The examples/IRrecvDump sketch will dump out details of the received data. The dump method dumps out these durations but converts them to microseconds, and uses the convention of prefixing a space measurement with a minus sign. This makes it easier to keep the mark and space measurements straight. IR sensors typically cause the mark to be measured as longer than expected and the space to be shorter than expected. The code extends marks by 100us to account for this (the value MARK_EXCESS). You may need to tweak the expected values or tolerances in this case. The library does not support simultaneous sending and receiving of codes; transmitting will disable receiving. Controlling a pedestrian sign with a remote. I extend the library to arbitrary remotes. Controlling my stereo over the web. I've used this library to implement a "Universal remote" to record and playback IR codes. I demonstrate turning something on and off via remote in my infrared bubble maker project. electrosthetics used the library to control a home theater receiver. 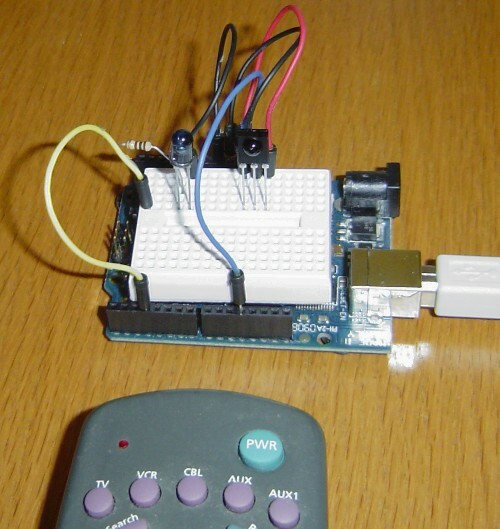 Arduino: Redefining the TV Remote - using the library and an ultrasonic sensor to control a TV by waving your hand. I was inspired by Building a Universal Remote with an Arduino; this doesn't live up to being a universal remote, but has a lot of information. The NECIRrcv library provided the interrupt handling code I use. Nick and Todd - thanks for the links to your projects. Rick - I think it would be difficult to use all 6 PWM outputs for separate IR signals, because there are 3 PWM timers and they use different flags. I would recommend using AND gates (e.g. 7408) to direct the IR output to the desired LED(s). Or maybe a 74138 demultiplexer. It would require another IC, but would be a lot simpler than trying to get all the PWM timers going. Evan - You have me stumped with that encoding. The durations are all over the place from 50us to 1200us, which doesn't match anything I've seen. If you're just interested in receiving, not sending, try my hash decoding. Was using your library to use Arduino to send IR commands to any entertainment system. Was not able to record RAW IR signlas and play the raw IR signal back. so i want to decode the IR signal instead of that receiver , the room locater can be programmed from room 001 to room 777 .
i used this script to get my data and used gnuplot to plot them . can you make any sense of the pattern , have you seen this pattern before ?!?! @evan: I've been puzzling over your room locator IR signals. It looks kind of like a RC5-style code repeated over and over without a gap in between, and with about 300uS per half-bit. But it looks like codes 1 and 3 are running slower (longer) than the others, which is strange. HH LL followed by 15 bits encoded as HL or LH. Each H or L has a duration of 300uS. However, the results don't seem to map to the room numbers in any reasonable way. ken, thanks for taking the time to llok at the signals. it continue with no gaps, cause the locater keep sending the signal continously so the receiver that is worn by the person can decode the signal and tel lwhere that person is at all times. i just wanted to make sure that its not just me who cant see a specific pattern in these signals. again, thanks alot for your help, i do appreciate it. I've added Xbox code support (64-bit RC6 codes). Take a look at my update and let me know how it goes. I'd like to second that other comment about the insufficient delay between sony IR-packets in your example. With my AV-receiver anything between 800us and 77ms worked, anything after that got ignored. Please change that to a sane value - other than that: Your library is awesome, thank you very much. Fantastic Ken. I'm so glad I've stumbled upon your blog. I have a bit of Arduino hardware and I'm looking at moving the remote control of my Panasonic AC from a USB IR blaster on my PC to an Arduino set up so it can work autonomously. I imagine once I get the components I'll be referring to your blog quite a bit. I note the Panasonic protocol that Wolfgang added a while ago. Is there any step by step instructions around on how to include that in the library, my programming experience is very limited? I'm trying to use this for a Panasonic Air Conditioner Unit. I am thinking of possibly using IR as a "general proximity" sensor to detect when I am close to and pointed at least roughly toward the source of the IR signal. So what I was thinking was that on a fairly frequent interval I would send the shortest set of codes that seems reasonably valid as an identifier of my beacon. Any suggestions as to what code to send? It would be better to occasionally mistake something as a beacon symbol than to spend too much time checking. Checking needs to be really quick. Hi Ken - this question was brought up earlier, but I never saw a response. I'm wondering why you didn't choose to use an Interrupt-On-Change to detect the initial IR transmission? For devices that need to do other stuff, and may not be receiving IR all the time, a 50us timer constantly ticking over uses more processor time than would really seem necessary. I am thinking of trying to rewrite this to use Interrupt-On-Change, but if you know something I don't about why it won't work, it would save me time to tell me in advance! Either way - thanks for the great work. Ok, I'm back. Actually switching to interrupt-on-change turned out easier than I thought. The drawback is that the receive pin can only be modified by changing the library itself, not through the sketch. In any case that's how I wrote it, though I suppose some fancy code could make it user-friendly to modify it within the sketch. I sent you an email with a modified version if you are interested. I've been banging my head against the wall for over an hour. I am having a hard time sending IR codes. I used your IRrecvDemo example to get a NEC IR code in Hex (FF8877). I converted that into decimal (16746615). I then wrote a quick sketch, I looked in your IRsendDemo. Never mind I got it to work. Though I wasn't able to get my IR LED to work with a resistor. Any ideas why? I'm really trying to get the RAW codes to work as my remote isn't supported. It's using 52 bit codes. You "replay" example works perfectly but I would like to store the codes inside the program (hardcoded) so they can be sent by serial command. Any tutorial or guide on how to get the "Raw dump" into a nice little sendRaw command? ... I can see your code is putting (-) before each other code, why is that? I am trying to control my Arduino PWM duty cycle at pin 3 via IR remote control. Duty cycle adjustment works fine with the push buttons. Once I add the "irrecv.enableIRIn(); // Start the receiver" I do not have an output pulse because I think both PWM and IR decoding uses the same Timer. Can anyone help me fix my problem so I can control the duty cycle via infrared? Can you tell me how to add Wolfgangs panasonic protocol into your code. I have strugled with it for a while now, but can't get it working. Hi, Ken, thanks for the awesome library. I've managed to get the Arduino Uno to send control codes to my Panasonic camcorder with one odd exception. The power code only seems to turn the camera off. The same code from the original remote turns it on and off. The only thing I can figure at this point is that there's something peculiar about the header or the power level of the LED that's causing this. Anyone out there have any ideas? @Anonymous: Are you getting an error message? @naimis: That's odd; the Panasonic protocol is fairly simple as far as IR protocols go. It sounds like the Arduino may not be receiving it correctly. Are you using the Panasonic protocol or a raw stream? @Scott: The library's raw record-and-playback never worked for this device. Presumably the timings were not precise enough. For sending and receiving codes, I first used modifications to the code that I had done myself, then I took the code changes posted earlier in the comments section and modified those to match the remote's timing. The results were the same in both cases - all known codes worked, but powering on did not; only off. The codes were obtained from a user-generated LIRC configuration file, but ultimately confirmed with IRRemote using both the changes I made and the ones previously posted in the comments section. @naimis: Do you have an IR receiver connected to the Arduino? If so, when you run the IRrecvDump sketch and press the power button on the original remote, do you get the same codes as are listed in the LIRC file? I found out that Wolfgang added the "old" panasonic protocol, so that's why it didn't work. @Scott: yes, with the library code I had written and with the (slightly modified) posted panasonic code both, the code for the power button is exactly the same as what was posted in the LIRC configuration I had downloaded. That was actually one of the first things I looked at. @Lauszus: I assume you require the newer Panasonic protocol (Panasonic2) which uses a 64-bit code. All the timings are identical, but there's an extra 8 bits between the subdevice and function codes. Additionally, the checksum calculation includes those bits as well. It shouldn't be difficult to modify Wolfgang's code to support Panasonic2. @naimis: Odd indeed. Any chance you could post the codes you're using? I am using this code to toggle some L.E.D's through switch statements. I am having trouble keeping an L.E.D high so long as a button is pressed. Right now the L.E.D flashes on/off at the rate at which it receives and decodes the signal. I need it to stay high so long as the button is held down and held low if the button is not pressed. I have a SANYO air conditioner remote which is sending out loooong stream of bits that i cant capture. according to google searches SANYO uses the NEC protocol but it does not get recognised by irRecvDump. irRecvDump says there were 76 time events which made me suspect the RAWBUF was full, so i set RAWBUF to 255 and it still was full. setting RAWBUF to a value over 255 crashes the atmega168 hence my dilema. anybody come across such a problem or have any ideas as to what to do? with a slight modification to the array size (changed it from 100 to 150) it did the trick. the Sanyo remote was sending 272 bit long pulses! not including any repeats or repeat codes as far as i can see. Still dont know what protocol that is but doesnt really matter at this point, as I can successfully record and play it back using the same code from ladyada. The only odd thing I see with the LIRC codes is that all the checksums (which is the last byte in each code) are backwards, i.e. they're in most-significant bit first order instead of least-significant bit first order. However, you mentioned that all codes work except for one, which is even more bizarre. I suppose it wouldn't hurt to try reversing the bits of the last byte in the code you're sending and see if it makes a difference. Hey guys, I've been playing around with this for days now trying to get it to work. I'm basically trying to make two arduino boards communicate over IR and create an IR handshake. 2. Ardunio B receives, then replies. It's basically sending rubbish over the LED - except if I remove "irrecv.enableIRIn();" then it works perfectly. What i'm basically looking for - is there a way to completely remove the affect of "irrecv.enableIRIn();" such as a "irrecv.disableIRIn();" so I can switch it off and get back to sending mode. I have tried "irsend.enableIROut(38);" but it doesn't do anything to solve the issue. Stop:1CB92, etc. And I'm adding a 0x in front in the code, then I've tried everything from 12 to 40 bites, I've sent it 2, 3 and for times. Most of the time the LED wont illuminate, knowing that it functions normally otherwise. I've read all your posts and those of others, but my stuff is stuck and I'm desperate. Would you have any helpful advices for me? May be my code format is wrong? Im on Arduino 0022. I'm having an interesting thing happen when I run this code on and Arduino Mini Pro 3.3V 8MHz. When I send an IR signal the pulses are all too short by about a factor of two. as measured on a scope). If I run the same code on a "standard" Arduino board it works correctly. To simulate the Canon command, to take pictures, I use the EOS_trigger() function, and a IR LED in IROUT_pin pin. If I comment the irrecv.enableIRIn();it works great, but with this line it doesn't work. What I'm doing wrong? It seems a delayMicroseconds problem. I tried in others pins and happens the same. How can I use my EOS_Trigger function with IRremote? I am making a universal remote for three protocols..and i wanted to store values of received bytes in eeprom so that even after power goes off i can use it later..i m facing problem that how to store 20 bit data in 8 bit or how to store values in eeprom permanantely..can u help me tht?? I've gotten as far as getting codes out of various remotes. My question is how you go about converting the hex to a usable code? For example my Sansui tv/dvd combo power button sends "Decoded NEC: 8E7152AD (32 bits)". Also if/when I have a working, transmittable code, can I simply plug into you send demo (or a slightly modified version) and voila? I'm a novice coder/hacker/artist hoping to use ir to control an artwork. Thanks for any assistance. Many thanks for this really impressive work. 1. I need to read 2 receivers and to be able to distinguish from which one the signal is received. B. Or do the receivers are all connected to same pins and in this case how to distinguish them ? 2. I'm not able to figure how if the following IR signal is readable. I wonder if the coding is changing at each signal?? Great tutorials Ken. Many thanks. I hope they live forever. i cannot get this to compile in arduino 0022. i've unzipped it into the arduino-0022/libraries folder, but get these errors when i try to compile or upload onto uno.. I found that if i copy the IRremote.ccp, IRremoteInt.c and IRremote.c into the ...arduino\arduino-0022\arduino-0022\hardware\arduino\cores\arduino it will compile. thought id share if anyone else had a problem. Thanks for your library - i made what i wanted to have in less than 2 days. Basically i wrote simple command parser for commands coming from serial port. Everything works fine until i enable mode for detecting IR from my IR sensor. Detection works, but when i try to send further commands after detection - nothing goes out. So i see that i parse commands properly, but calling .sendXXX for any protocol fails (or, to be exact, IR LED doesn't send anything). I can exit this mode and start to send after power cycle (reconnect USB). I hope you can see what i am doing wrong after setting (ProtoCode = READIR), decoding some IR commands, and setting (ProtoCode = e.g. NEC). First GREAT post, I'm new to all of this, and your post was clear and I got my arduino and my IR receiver to work with the remote (supplied as a kit) in no time. But I got an interesting thing happening, I'm sure its a simple thing and just being new I don't get it. I attached a LCD screen to the arguing and wanted to control the backlight with ANALOGERITE, after failing for many times I decided to go back to basics (the best way to debug). So I took only the declaration of things and set up the example FADE with a led. The led only get "switched on" at the far end of the scale (ie analog write of 255). I can Guess it has to do with the PWM, but not sure how that can be. I have the IR receiver connected on d4 of the Adriano and the fading led on d3. Never mind, I found the problem. Turned out that the buffers I had in memory were filling up the ATmega328's ram! As soon as I changed the type for the raw array I was sending to const unsigned int, the problem went away. A cautionary tale for others who are using sendRaw. However, I did discover a bug. In IRRemoteint.h, line 160, the define for TIMER_DISABLE_INTR should have an = instead of the dash. As it is, it doesn't do anything. PS: Great libary, thx a lot! want to know how to clean the raw data for sending? check my blog! I have one question about IR library,,why this library can't upload sketch IR example with board arduino NG or older w/atmega8?? Can someone teach me the Ir protocol's and how they work. Just wanted to say thanks for the excellent library. I managed to port the NEC send functionality to an ATtiny13 (after much reference to the data sheet). The messages are being received perfectly by an Arduino UNO. I have problem with Silva Schneider sm350 DVD micro line system. I don't have remote and can't find codes for remote. If anyone has similar remote control to send me codes I would be very happy. i am working on a project where I use an arduino with ethernet shield to replace my IR remotes with an iPad app. My AV-Receiver from Yamaha is working fine as it is using NEC codes. But I am stuck on my cable receiver remote. Power on off is somehow working but not really reliable and I am not able to make others work. Any ideo how I can get this to work? Any help greatly appreciated. I successfully used your library to jigger up a little 328-based board that sets R, G, and B values on a strip of impossibly bright LED's from Sparkfun, and it works great. I've moved into a small apartment, though, and now I'd like to be able to duplicate the effects of an IR-remote repeater: A little IR receiver (with vcc, out, and gnd) sits atop the media center, with all the (my wife says "ugly," I think they're kinda cool) components hidden behind a nice wood sliding panel. I'd like to beam arbitrary remote codes from arbitrary remotes at the receiver sitting atop the center, and have it repeat the codes to a few IR LED's dangling inside, also behind the wooden slidey thing. So far, I only got the codes to repeat to one device (a VIZIO blu-ray player). The comcast box and the Panasonic TV are immune to the charms of IRrecord.pde. Any suggestions of where to turn? My code doesn't care what the codes are, it just wants to repeat them to a place that can't see them. Should I just go with a photodiode, and have the IR LED repeat what the photodiode is sensing? Any help would be appreciated. Oops. Sorry about posting that twice. Dear Ken - Thank you very much for this wonderful library. For anyone having troubles with sending raw codes - sometimes the code is too long for the buffer. Change the RAWBUF 76 to anything longer e.g. 100. It worked for me and a samsung hd recorder. Also try to repeat the code 2 or 3 times. "you can't just use a photodiode or phototransistor." Not totally Right, I've just decoded a NEC controler using a bpw77na ir photodiode, BC548 transistor and a TTL hex inverter 7404. It manages to decode the keys, but it's a matter of trying and good luck, out of 50 attemps, just 2 of them get a code, so it's trial and error. Just wanted to tell anyone like me who aren't able to get some nice IR photodetectors that there is a work around. I was testing to see what libs work with the attiny45_85 core for Arduino (hlt.media.mit.edu/wiki/pmwiki.php?n=Main.ArduinoATtiny4585). Attiny45/85 has 6 I/O pins from which 2 are PWM (http://circuits.datasheetdir.com/18/ATTINY13-pinout.jpg). Do you think there is any way to make this lib work with the 8 pin ATtiny? Is it possible to make this library work with 2 seperate IR receivers? I have a robot that needs to have IR communications with its docking station, but the robot needs to receive info in 360 degrees, the most 36kHz/38kHz/40kHz IR receiver chips don't allow for that. I'm totally frustrated. I cannot get the transmitted code to match the original. Even IRrecord detects the right code (0xa8b92) but they transmits something different. I confirmed this with Winlirc's tools. Can anyone help? I'm using an UNO with a Sony DVD power code. Agian, receiving is rock solid but sending does not match. Thanks. Chris I am having the same problem someone please help. I can decode ir signal. But I can not get the tv to turn on with the code I get back. Wire54321, I checked my IR sending codes with WinLIRC's IRGraph.exe. They now match. I misunderstood the bit setting in the irsend.sendSony command. I still cannot get the DVD player to recognize the IRcode but WinLIRC does. So I must be very close. I tried xoscope but have now lost my IR detector. If I can figure out how to use it correctly, it should help a lot. I'm happy to say that I got this working. It was in fact the delay(100) statement as someone above suggested in a previous posting. Set as delay(50) works for me. I really thought I had tried that but probably before I had other setting corrected. I've got really good distance and it works very consistently. Btw, Soundcard Scope work best for me out of all the open source oscilloscope I found. Thanks Ken and everyone who has posted info. but i have a problem when i try to send signals, it works once and cut off the communication over serial and ir. nevermind, i know how,just dont put resume() and restart the reciv. irrecv.enableIRIn(); //// <<<<<------- works for mee. This is what can be called an efficient post ! I used your library and could easily define it what SONY protocol and had the IR codes. I could not send them back with success and then just made a loop with IR send demo script augmenting the delay between the codes until the robot moved :-D With the right delay i can now control the robot with and arduino and sensors. Thank you, from France ! Has anyone had problems controlling LCD projectors? I have Ken's library working for Sony's, Motorola DVRs, Samsung TVs, etc, etc but I cannot get any of my conference room projects to respond to IR codes. I have tried it with Epson, Mitsubishi, and Eiki's so far. Thanks! I'm using your receive code with a Hauppauge remote control and although it works I'm getting 2 different codes when I press any particular button. They don't alternate as such, just seems random which code I'll get. No problem though, I just have my Arduino code check both. Hi there, and thank you so much for this great work!! I have got my stuff working with a Arduino Mega 256. Here comes my issue. Not really able to get this to work? The signals is way longer than normal signals. Any tips? hi a big thx. and i have a question this library can work with firmata protocol ..
or in any other way. i want to read ir code from firmata in simple pc software..
and my whole project live on firmata . First of all, thanks for the library. I'm using it to control a NEC beamer with an arduino duemilanove 328. I'm able to decode the signal from the remote control and also to send it. The beamer recognizes the signal to switch it on (if the beamer is turned on), but it doesn't turn it on when the beamer is off. The remote control only switches it on if you keep pressing the on-button. Then I get first the signal (0x189710EF) and then only 0xFFFFFFFF (0 Bit) from the decoder. Has anybody an idea how to implement this on the arduino? Awesome job. I easily used the library to remote control a fan. allows you to calculate the perfect resistance based on the LED's specific requirements. I changed the resister to 38ohm and performance was greatly improved. I am a very experienced software engineer but a complete hack when it comes to electronics, so if anyone can verify that my logic is on target I would appreciate it. Also, Ken, if we want to switch the output to timer 1, where can I find the different values as compared to timer 2? all I get is 0 from irrecv.decode. I just did a small sendNEC call that works with the ATmega8. Some forum suggests to make one of the ISR code into a function that is then called from the other ISR, but for this I need to combine both libraries. I have also tried using TIMER1, and the code compiles, but when I upload it to the Arduino board it doesn't run correctly. TIMER0 doesn't work because it conflicts with the Arduino lib itself. New experiment always innovate new things that out come results may be positive or may be negative but you learn something new as in the same in this video great work is done by the Ken shirriff's. The problem is that when I send the codes the air conditioner doesn't receives the command. I use my cellphone to see if there is IR light going out the IR LED. The light goes out but the air conditioner doesn't receive. Do you know whats is happening? I would ask you if it is fully working on Arduino 2009 with ATMEGA 328P because I can receive but not send Sony IR. It's 3 days i'm trying every thing but none is working. Thanks for your great library. I'm making a wireless (i.e. over wifi network) remote with a wireless shield and was a bit overwhelmed. This page and your other tutorial really made the difference. I needed to make adjust Sony code to reflect the Time Warner Cable Synergy V protocol and LIRC info. To my amazement, the "guide" came up on my cable box first attempt! Now, not only do I know all about IR protocols, but I'll be able to change channels with the cabinet shut vice getting up every five minutes to remove and reinstall the child guards. Thanks for sharing this! I there anyway to use this lib with an arduino clone using mega168 and an 8Mhz crystal ? Hi, fist off, thanks for a fantastic library! I was wondering if your library supported sending OBC codes at all? > Hi, fist off, thanks for a fantastic library! > I was wondering if your library supported sending OBC codes at all? I posted a comment on this page in June that includes a macro that builds a RC5 extended command and takes an OBC as one of the arguments. I have found this issue using your library, before enabling RX it sends SONY IR code in a correct way, after enabling the receiving object it doesn't shoot a correct IR. I'm using two Arduino 2009 with ATMEGA 328, one shooting, one receiving. Maybe there is some issue on timers? I'll post it also on the comments in the article. @Craig - thanks for taking the time to reply! I'm afraid your code goes right over my head. First of all, how do I find out my device ID? Second - the #define RC5XCODE - is this where you convert the OBC code (ie 190) into something that can be sent? I cannot for the life of me figue out what is going on here! I'm using a Samsung TV, and until I found out about OBC codes, I was recording the button presses and outputting the results as a raw array of ticks and spaces. Many thanks again, for your patience! Not tested on the complete range of arduinos but I think will make this libary more portable. > First of all, how do I find out my device ID? for IR codes, tools, etc. > for the life of me figue out what is going on here! It's a macro that takes the device and obc codes (and the toggle bit) and moves the bits around so they're in the correct format for transmission. Maybe once you understand the format of the IR protocol, the macro will make sense. One advantage of a using a macro is that if you're using static arguments, all the math happens at compile time. > as a raw array of ticks and spaces. It's a lot easier to make changes if you're using OBC or EFC codes. Does anyone know why this library doesn't seem to work with the tone() function? Using this IR library with any audio functionality seems impossible. Grr. Has anyone tried to use this library with LabVIEW? I am in the process. It worked perfect. Thank you very much. But a problem occured to me using your library (for receiving IR) and SparkFun's 20x4 Serial enabled LCD (via SoftwareSerial). When I write somthing on the LCD _before_ i initialise the IR-Library, everything is fine. But if i'm trying to write something to it _afer_ initilising your library, the serial display only shows strange characters. Maybe it's a problem about the interrupt? Is that an answer to my question? If so, I don't understand what you mean..
Can you give me a further explanation? Sorry thats my anonymous post. Try masking away the high bits of the byte you get from read() (ch &= 0x7F). If that isn't enough for you to make it work, try posting a question in the Arduino forum. To enable both send and receive at the same time or in the same sketch, the timer needs to be enabled and disabled depends on send/receive. The existing code what Ken has in the original post, will become like this. sorry for poor formatting. you check this line..
"irrecv.enableIRIn(); // This is mandatory to re-enable the timer2. " irrecv.enableIRIn(); // This is mandatory to re-enable the timer2. sorry but i dont get it. Why are you all talking about Serial.READ? I'm WRITING somesthing to the LCD Display.. Sorry, I should have read your post more carefully. My suggestion to move your question to a real forum is still a good one. Many thanks for this very useful work !!! I'm testing your sample to communicate between two arduino boards. One board sends data and the other receive it. I'm use your sample code and connect the two boards with a transistor driven by the sender with a resistor on collector to 5V to invert the signal. such a great post. this helped me get a poor-man's home automation system up and running, talking to a frigidaire air conditioner over ir. had to convert from an lirc file, but your background information made it really easy. Ken, your library is GREAT, thanks for sharing it! I'm trying to make a tv/cable remote for my almost blind mother, and your library made it simple for my Uno to turn the tv on/off. Unfortunately,I'm having trouble with the Comcast Motorola DCH70 cable box, in that using the raw codes, I can get it to turn on, but only BRIEFLY, it turns itself off about 2-3 seconds after I turn it on. I think the fundamental problem is that the DCH70 uses, I think, an XMP protocol, so I'm wondering if you (or anyone else here) might work up an add-in to your library for the XMP protocol? I want to thank Ken for his wonderful library. After having read all comments I was able to tweak the library adding panasonic support and control my home's stereo system. I suggest to anyone attempting to cope with panasonic's remote to apply suggestions found on this post's comments, expecially widening buffer to 104 and change timings in .h file. and I was already ready to give up as it did not work on my Philips matchline TV, but then I decided to try another (very old) small Philips TV. worked like a charm. I want to use your Library with the new Arduino IDE Version. But there are some Errors during compiling of the RecieveDemo . Hey, did anyone got it working with an Attiny 45 or 85? This is very nice, thanks a lot! 1 question tho have you got any idea how i could send out an array in max/msp ? Thanks for the great library! I've been trying to implement the Panasonic code supplied by Wolfgang and modifications by others. Everything seems to work, with the exception of sending to my Pani TV. For example, using my original Pani remote as well as the the other learning remotes I have programed for use with the TV, they all give me the same results with the IRrecvDump file for the power function. They all produce the hex BCBD 48 bits, which is also what is listed in the LIRC files. I've tested the output with a camera and I see the IR led flashing. I've even gone so far as setting up a second Duemilanove to read the the send results from the first, which also yields a BCBD 48 bits. I've tested the IRsendDemo on my Sony (sendSony) and my Onkyo (sendNEC) equipment, which works just fine. I am stumped. Any thoughts? I want create a bluetooth remote infrared with Arduino and Android. I find a java parser for lirc conf file and I want test it. It is possible create a most generic send function on arduino for codes parsed by Android? I have all info and data (header, zero and one code, etc) from lirc file and i think it is possible compute a raw send data with Android and send it to arduino via bluetooth. The arduino decode it to IR Led. ..since I'm running a low-voltage ATMega at 8MHz for a hand-held battery powered design. With the irsend.sendRC5 command it is easy to send commands. e.g. "irsend.sendRC5(0x20, 12);" will move the channel up on a TV. But what if I dont want to use RC5 on a TV but on say a Philips CD player 0x20 is the code for "next track" but how do i tell the code that I want it to be for a CD player and not for a TV? In the RC5protocol this is done by 5 address bits and 6 command bits, but how do i set that in the code presented here? I want to receive IR-Codes with your library and show text depending on that codes on a LCD using SoftwareSerial. Here's the code which enables the interrupt, but i don't know how to change it, so it uses Timer 1 instead. Anyone a clue on that? Great library, I have used it for a very short time and after a shaky start I currently have my arduino turning on and off my Sony surround sound system and Wharfedale TV at the same time whenever I reset the arduino. My next task is to make it web accessible with all my remotes. I have the IR codes, just a matter of writing the web page and then driving the arduino. Has anyone done something similar? I am curious as to whether the ethernet shield will interfere with the IR code. Only one way to find out - time to pull all the wires out of my arduino and give it a go! Acesse o site da EMPRETECNET, eles fabricam um KIT com uma placa compatível com arduino duemilanove, uma placa de rele, de potenciômetro, de sensor de luz, de sensor de luminosidade, de buzzer, de botão e demais componentes que podem ser realizados vários experimentos sem a necessidade de solda. Qualidade excelente!! First of all thankyou Ken for this great info. I had a huge problem with split air conditioners. They simply never worked. It has been a few weeks but a finally got it. 2 - This remotes uses 1.25uS tick so you have to change USECPERTICK to 10 in this same file. Ken: thanks for the great library! I am using it for the Popular Science Build Your First Robot project. For some reason I can't get it to recognize my universal remote. I have tried numerous codes from various vendors. I am currently running the dump program and it always come back with "could not decode message" Following is a typical response: Raw (26): -7080 2350 -700 550 -650 500 -700 550 -700 450 -750 500 -700 500 -700 550 -700 1100 -700 450 -750 500 -700 500 -700 500. I would appreaciate any suggestion that you can make. I added the Panasonic and JVC protocol and updated the library to work with Arduino IDE 1.0. I made a pull request at github. I'm already using your code with my JVC remote. Hi, thanks for that great Library. I experienced that very long delay times don't work when using sendraw. It's a very good proyect, my congratulations Ken. My teacher and I want to make this proyect to control my class' projector, but when we are decoding the codes with IRrecvDump and press more than one time the same botton, Arduino send differents codes for the same botton, and we don't know if it can be caused for we are using a 35 Khz receiver or the program can't decode our remote control. Please we need help. Thanks, I hope your answerd. The receiving part works great. but I can't send the code. I think the problem is in the IRremote.CPP with the pin 3 part. Is this true are, is the problem probably something else ? Thanks for the Code !!! But maybe you have some experience in build a software that maps the codes from one remote to codes of another. The Idea is that i use a Remote of my choice to control several devices. You might find my "ATtinyRemote" project interesting. It "translates" commands from my panasonic remote, so I can control my JVC stereo without needing to use the second remote. Thanks, you do exactly what i did… you read your Type and Map it on the other. Do the sending function work normally. If it does, then try to add in a delay or point the remote you are using away from the IR LED, as you can disturbed the signal with your remote. Does anyone have code for getting two transmitters and receivers to work side by side off the one Arduino? I'm trying to use the beam break code with two beams rather than one. Thanks for the library.Will this work if i use Atmega8 or lower . It worked well for 328. I'm trying to integrate PANASONIC routine of Wolfgang (http://www.arcfn.com/2009/08/multi-protocol-infrared-remote-library.html?showComment=1253216531228#c4344993120598576281) in IRRemote, but I've a problems. When I try to compile a sketch, the compiler return this error: /IRremote/IRremote.cpp:169: error: no ‘void IRsend::sendPanasonic(long unsigned int, long unsigned int)’ member function declared in class ‘IRsend’ and, (I don't know C++) but I've seen that in other function (sendSony, sendRC6 etc.) the arguments passed are "unsigned long data, int nbits" but in sendPanasonic are "unsigned long address, unsigned long data" and I think that the problem is there. Or for semplicity :) Is possible to download IRRemote with Panasonic already included? I've remote control Panasonic N2QAEC000024. It supports the Panasonic protocol as well. but how can I use this codes through SendPanasonic? It look like your remote only sends out 24 bits, try changing the following line to https://github.com/TKJElectronics/Arduino-IRremote/blob/master/IRremoteInt.h#L187 to 24 instead of 48. That will make decoding work. Now juts remove the first for loop and change 32 to 24 in the next for loop. This would send the power command. I will update the library to support 24-bits as weel if it works. Can you verify if is all ok? Just before the for loop. I've added "data = data << (32 - 24);"
before the for loop, but don't work. What about decoding, does that work? 0x40040E is your power command. You could just make a switch case (http://arduino.cc/en/Reference/SwitchCase) as I did with my AttinyRemote: https://github.com/TKJElectronics/ATtinyRemote/blob/master/ATtinyRemote.ino to make it react to different buttons. Just remember do to modify the library as I wrote earlier. I just read your prevoius post again. It look like your remote is 36bits long. Try to change PANASONIC_BITS to 36 and see if decoding works properly. If that works, I'll guide you though the sending functionality as well. It will print out all 36 received bits. These codes are generated from power button. It looks like it's sending 48 bits anyway. Change PANASONIC_BITS back to 48 and see if it works. but first of any code there is one "E". For example. for power button the return code is E143C26, for T/+ button is E14465C etc. Are you using the right sketch? The predata or address should be 0x4004 and the data should be 0x0E......? (It wouldn't print the first 0). It looks like you remote sends 24 bits predata and the 24 bits data (mine sends 16 bits predata and 32 bits data). But it should work just fine anyways. Try using my version of IRrecvDemo.ino and all the 48 bits should be printed. I'm using your sketch (https://github.com/TKJElectronics/Arduino-IRremote/blob/master/examples/IRrecvDump/IRrecvDump.ino). But what can I do with this codes? Is possibile that your remote IR sends 16+32 bit and my 24+24? Yes, that's in fact what it does. But it doesn't make any difference. Everything should work just find. The reason why I decided to split up the data is because the Serial.print() command doesn't supports an unsigned long long data. I'm sure I do something wrong but what? You shouldn't modify the sketch. Just download the library from github and only modify the example sketch. The reason why I wanted you to modify the library was because I only thought it was 24 bits (I read your first post too fast). You should not uncomment anything or change 0x8000 to 0x4004! You should just be able to use the original library and only change the data being sent. Thanks for your work on updating the library (and thanks to Ken for starting it in the first place). You might consider adjusting your fork accordingly. Your IR LED output pin will be 9. Thank you very much - this is maybe one of the best libraries in the ARDUINO - world. But there is still one question: Is "RECV_PIN = 11" mandatory or can I use every pin for IR - rx? Yes you can use any pin you like, as the receiving routine is done by a timer overflow. Hi, I have a Mega 2560 R3 and can't get any of the sample programs to work. I am fairly new at programming so any help is appreciated. I have a Mega 2560 R3 and can't get any of the sample programs to work, I know that both my receiver and remote work. Any help is greatly appreciated. See my fork: https://github.com/TKJElectronics/Arduino-IRremote as it supports the ATmega2560 as well. Hey guys, this library seems really good. Unfortunately as the poster before me I also can't send any codes. The receiving seems to work OK but I suspected a strange behaviour: even when I use SONY TV-set controller I can't get the Arduino to properly decode it's signal. It can only detect the signal as RAW. In fact I did not find any remote in my house whose signal can be decoded which is strange. I'm using an Arduino Pro Mini 3.3 V version running at 8 MHz and a TSOP34838 for IR receiving. I've managed to solve the previous problem by changing the SYSCLOCK parameter to 8000000 in the IRRemoteInt.h file to accomodate the Arduino Pro Mini's 8 MHz clock. After this the sending and receiving are working fine. Thanks for the nice library Ken! I have a question, i'm using PWM pins 6, 9, 10 to control three servos, and i'm using this IRremote library to control the movements of a robot with two wheels. but since this library uses timer2, pin 11 is unavailable. however, instead of following SHARP IR sensor INPUTS and my Apple Remote commands, the robot simply rotates to the right.. very weird glitch which i cannot find the source of. Is there any other own channels that are unavailable that i'm unaware of ??? any help would be greatly appreciated..
could you make it work on CHIPKIT UNO32? The receiver is picking up a lot of noise when my room is dark and can be canceled by turning on the light. Also the raw codes I receive with the IRrecvDump is pretty much the same for all the buttons on my remote (a Bang & Olufsen Beo4 remote). Can anyone help my with this? Ken, using your wonderful library, I've built a sort of IR extender to control my satellite receiver and my media player hidden into a closed piece of furniture. Unfortunately I am not able to control my sky box, that I think uses the RC6-6-20 protocol (see here http://www.hifi-remote.com/wiki/index.php?title=RC6-6-20). Do you think it is possible to add this protocol to the library? Do you know if anyone had success in controlling a sky box? Thanks. I think the main issue for me is that I'm using a 38khz receiver while Sky remote works at 36khz. It is differently possible. Just copy the routine and set it up to use timer1 for one of them and timer2 for the other one. But I don't think it's an issue decoding an 36kHz signal with a 38kHz receiver. I have successfully decoded my Panasonic remote that's running 35kHz using a 38kHz receiver. Doesn't work with Mega board. THNK YOU A LOT FOR THIS THING!!! Just don't create the sending instance. This is a LOVELY piece of code - works a treat. I have one TRIVIAL comment... for lots of application, that little light that tells you your handset batteries aren't flat... D13 is not a good choice - because using this with any other hardware, say, Intranet, radio - the chances are they want to use Pin13. I notice you've done direct port manipulation on the LED to get the speed up - was that necessary? As if not it'll make life a little easier to adjust the library to allow a custom port pin. just checking?